Build it and they will blow it up. I think there must be a kind of Field of Dreams mentality among architects or, at least, among the politicians who hire architects. Recall that in the 1989 fantasy film of that name, the hero does some magical time traveling, then builds an enchanted baseball field where ball players from the afterlife and nostalgic fans can join together to enjoy life the way it used to be —life the way it was meant to be. Build it and They Will Come! Thus, take an area infested by poverty, unemployment, drugs and crime; then, build a nice place for everyone to live and “they will come.” They will no longer be poor, they will not be involved in drugs or gangs, and they will all magically have jobs. Life will be good because the inherent goodness of architectural intent will trickle down and seep into the people who live there. In the words of Le Corbusier, "It is a question of building which is at the root of the social unrest of today... ." What can I say? Welcome to Earth, alien architects! The best (worst) example of such thinking I know of is the Pruitt-Igo urban housing project in St. Louis, Missouri. It was designed by Minoru Yamasaki (architect of the World Trade Center complex in New York) and completed in 1955. It degraded so swiftly that between 1972 and 1974 all 55 buildings had to be destroyed by implosion. It was the worst failure of public housing policy in the history of the United States. The Neapolitan version, on a lesser scale, is the so-called “Vele di Secondigliano”—the Sails of Secondigliano, (also known as The Sails of Scampia, that part of Secondigliano, a northern suburb of Naples, where the housing project was built). The Vele consisted of seven pyramid-like buildings (really, ziggurat-like—the ancient stepped pyramids of Babylonia) that reminded people of sails. The buildings were named by color —the blue sail, the red sail, etc. The Vele were put up between 1962 and 1975. 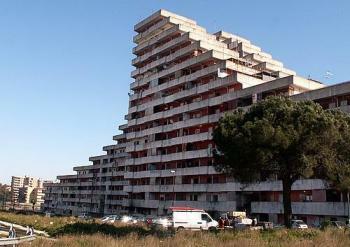 The architect was Franz di Salvo, one of the most prominent modernist architects of post-war Italy. So the buildings went up and everyone waited. It reminds me of the time I tried to use a small portable air-pump to force some more air into one of those already super-inflated small-rim emergency spare tires. The tire had more pressure than the pump, so the air went the wrong way, from my tire into the pump! That's what happened with the vele: no goodness and light flowed from the vele into Scampia; the area, one of the poorest and most run-down in Naples, flowed into the "sails" and filled them with grime and squalor. Three of the original seven buildings were blown up between 1997 and 2003. The rest are still standing, condemned, and partially occupied illegally by squatters. 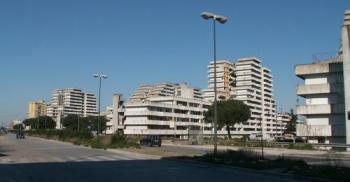 The construction stems from various post-war laws meant to encourage public-works urbanization in Italy, such as the Ina [National Insurance Institute] plan for home construction of 1949 and Law 167 of 1962. The goal of post-war urban building was to give homes (1) to people who had lost theirs in the war, (2) to those who had never had a decent place to live in the first place, and (3) to cover the massive influx of new workers moving from rural areas into the cities for all the jobs that drove the Italian economic miracle of the 1950s and 60s. I am not making a case for or against “modern” architecture. I don’t know that the way your house looks from the outside has all that much to do with how happy you are. For all I know, people who live in Le Corbusier-inspired people-hives can be very happy if they have good jobs, good schools, and are in love and loved. But even the detractors of modern architecture (Tom Wolfe, in From Bauhaus to Our House, asked, "Why would someone who works in a factory want to live in one?" in reference to the unadorned stacks, slabs and pipes of modernism). Even they would admit that you should give the building a chance, that some social support should be in place before you start moving people in. 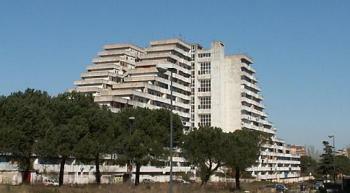 Some critics say that the sails were “an architectural horror.” They are missing the point; the “vele” design has worked well elsewhere, in Villeneuve-Loubet on the French riviera, (architect, André Minangoy), for example, so there must be a reason why the housing project failed here. Perhaps it has to do with the fact that Secondigliano is a laundry list of social problems: unemployment, drugs, school drop-out rate, and organized crime. When the buildings went up, the area had about 80,000 inhabitants, 40,000 of whom were said to live in the Vele. That number is way too low. The buildings were populated in 1976 and 1977, but when the 1980 earthquake struck, squatters moved in from elsewhere to Naples and found room wherever they could, including the Vele. A more realistic number for the Vele in that period would be about 60-70,000. AND —plans to finish the supporting structures and services were put on hold: there was no market, no nursery, no gym, and not even a police station (!) for 20 years. (There is now a Carabinieri [State Police] station. I walked up to it yesterday, and it is sealed off like Ft. Apache. There was one gigantic German Shepherd watch-dog sitting on top (!) of the compound, looking down for intruders. He spotted me and went nuts. Nice doggie. Here, want a camera?) What were supposed to be parks and gardens simply lay fallow and degraded, becoming such rubbish heaps of left-over cement blocks and discarded syringes that the area figures prominently in the recent book Gomorra and the film of the same name (a pun on the Biblical city and the name camorra—the Neapolitan version of the mafia). The decayed buildings themselves became a symbol—ziggurats of evil. In 2006, the mayor of Naples said she would like to shoot the architect of the vele, blow up the rest of the buildings and put up more “human” architecture. The widow di Salvo remarked that it was too late for the shooting, but she wondered —as do I— at the bizarre thinking that blamed an architect for the social ills of the city. The vele were not “human” or “inhuman”. They were just buildings, put up in a particularly inhuman part of the city. Me, I would leave the architect alone and shoot blame the mayor. As they now stand, there are four or five of the vele still up and likely to stay up. Yes, they are in a horribly degraded condition. Some of the bottom floors have been cleared, such that only the supporting pillars are visible; that’s where they place the charges (just in case) for the ultimate “furling of the sails” by implosion. Yet there are many apartments still occupied by squatters, and the city is reluctant to replay the scene of a few years ago when squatters fought cops tooth and nail in order to hang on to the only homes they had, no matter how squalid. Thus, a plan now calls for the squatters to be moved gradually into other quarters and for the remaining buildings to be recertified as sound and then be given over to civic use, most likely as premises for the University of Naples. That may work. The degraded vele are now surrounded by smaller blocks of six-and- seven-story apartments that look clean and maintained. Also, the area is now well-connected by the new metropolitana train line (about 20 minutes' ride) to the downtown area, whereas when the buildings were new, they were really in the outback, what locals called the "Neapolitan hinterland (using that nice German expression). Maybe it's not exactly what Franz di Salvo envisioned, but at this point he'll take what he can get.